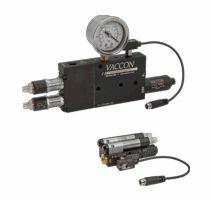 Vaccon’s VP01QRBV and VP35 Solenoid-controlled Modular Venturi Vacuum pumps feature dual solenoid valves to control air for both vacuum control and blow-off for rapid part release. The integral vacuum and blow‑off circuit design provides instantaneous response for high speed assembly and pick & place applications. The VP01QRBV Series vacuum is a compact, low profile, lightweight unit ideal for small part pick and place applications. These compact pumps require little installation space and can be positioned close to the vacuum point for fast response. The VP35 is a Mid Series Modular Venturi Vacuum pump with dual solenoid valves for vacuum control and rapid part release. Like other Vaccon Mid Series pumps, performance can be updated by swapping out the interchangeable venturi vacuum cartridge.